How To Use Surveys To Generate MOTIVATED SELLERS In Your Real Estate Market! This is Josh Schoenly, co-founder of Client Alchemist. And what we’re going to do in this video is walk you through a seller campaign that I created on Friday that was created with the purpose, or the intent, of getting the most motivated sellers in my target area to raise their hand and self-identify that they are motivated. And this strategy is one that I stole from my buddies Michael Reese and Woods Davis over at Digital President. So credit where credit is due. In a minute I’ll walk you through the actual campaign, start to finish. But the bigger picture here is that this strategy, the concept here, you can leverage in many ways. There are lots of opportunities, lots of ways that you can leverage this concept, this idea. And so, I’m going to break that down for you. But first, let’s walk through the campaign and those results. The results were just okay. They weren’t as good as I was hoping, but I learned a ton and I wanna share that with you as well. So let’s go ahead and go to screen share mode. And let’s find … gotta find the right thing here. Alright. So, here’s the campaign. It was a Facebook campaign and it was a lead ad campaign. I actually ran a link click campaign as well. And we can even … if you’re interested, we can check that out as well. But the one I wanted to unpack here was the lead ad campaign, okay? And, so far, I’ve spent about $43. 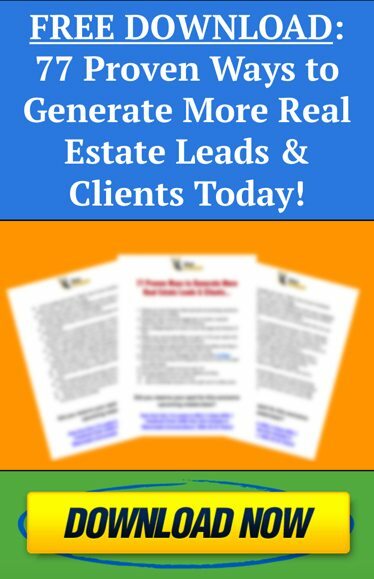 Generated four seller leads. Because the simple fact that someone is willing to go through all the hoops that I’ve set in their path indicates that they have real motivation and a real interest in the offer that’s being made. So, let’s unpack the campaign. Let’s look at the actual ad first. We’ll open that up. And click on preview. Let’s open that up. As I mentioned, this is a survey. The idea is presenting a survey and, so you can see the text here. And then what I’ve done here is (and this is a big one). Because when we’re doing these kinds of campaign on Facebook, or just on social media in general, the images that we use are critical. This is an image that I created with Canva. Where I took pictures of the signs or marquees for, in this case I think it’s 30 … yeah, it’s six by five. 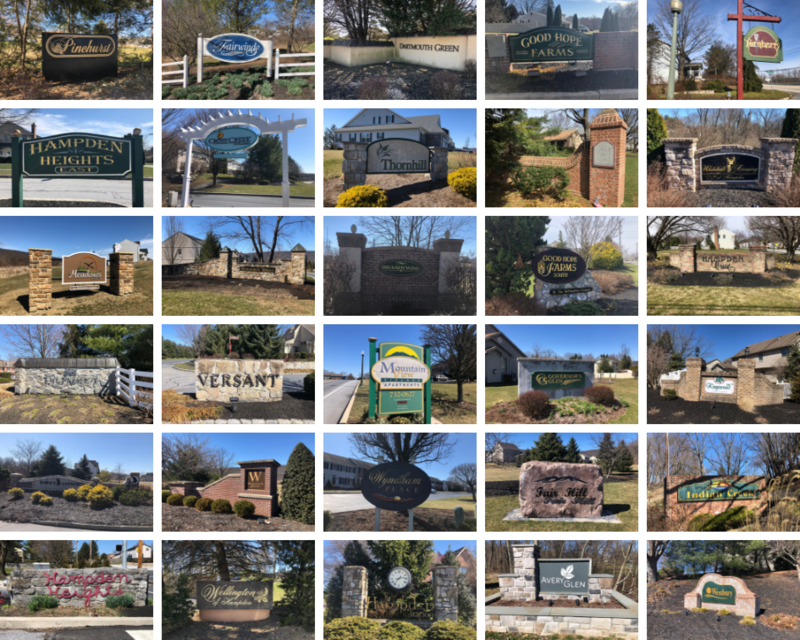 30 of the neighborhoods in Hampden Township. Hampden Township is where I live and it’s my target farm area, okay? So, I actually, just as I’ve been running errands and going about town, I’ll pop out and I’ll get a picture of these and I put it together. Again, with Canva.com. It’s free. They have a paid version but you can do lots of cool stuff with the free version, just like this. So, I’ve put this image together and I think it’s one of the reasons why this is getting so many clicks. We haven’t even unpacked that fact, but the amount of people clicking on this tells me that we have a winner of an offer. It just might need some tweaks to it, to really get it dialed in. And then, below the image, it says, “2019 Hampden Township Home Ownership Survey. Learn more.” So, what happens when we click “learn more?” Let’s find out together. So we click on “learn more”, and it’s a pop up. Because that’s what a Facebook lead ad is. It’s a integrated lead capturing mechanism. Basically, it’s an integrated lead form or capture page, right on Facebook. Now, look at this. We’re asking four questions. Four questions. “Are you planning on selling your home in the next 12 months?” That indicates motivation, intent. And then, it’s got it pre-populated with information. Now, this information is not accurate because we have to test these forms a lot. Because we create these for our … my own business and for other clients of ours. So, what would normally happen is, my actual information here would be pre-populated. And, after they complete their answers … Well, I’m not even gonna bother with that. After they complete their answers, they click “submit” and, at that stage … Well, actually, I’ll just go ahead and click “submit.” Oops. I gotta … I forgot. Yes. Yes. No. Yes. I don’t know. Doesn’t matter. We click “submit” and then it says, “Thanks for taking the survey. We’ll be sending your Hampden Township Home Sale report and the two free gifts, as promised, A-S-A-P.” And then my information. And there’s the ability for them to actually call me right then and there, if they are so inclined. Now, of the four leads that have come through so far, two of them said, yes, they are thinking about selling. And two of them said, yes, they also know someone who’s thinking about selling! So, even though the cost per lead is on the high end, that’s pretty awesome, all things considered. Where I’ve got two people for $43 who are motivated enough to complete that full survey and tell me that they are thinking about selling their home in the next 12 months. And the reality is, if they’re saying that in the next 12 months, based upon the time of year that I’m recording this video, it’s probably gonna happen sooner than later because the spring market and the summer market, right? That’s where it’s at! So, here’s what’s crazy exciting to me. 69 people clicked the “learn more” button. 69 people. Only four completed the survey. Now here’s what I’m going to test, and I’ll be reporting back to you on a similar video like today. Which, incidentally, if you would like that update, make sure that you subscribe to these videos and check in. I’m going to tweak the survey to see if we can get that number higher, right? Because if we can get that number higher, if we can double the amount of people that submitted the form, well now, we just cut our cost per lead in half! But this tells me that we have a winning ad. We have a winning offer. For that many people to have clicked, something about this is really, really resonating. And I can guess why. It’s super congruent. You know, it’s a survey, which people like to take surveys. There are bribes to get them to complete the survey. So, there’s a lot going on in our favor here that would indicated why it’s working. We just need to tweak it a little bit. Let’s also, since I brought it up, I’ll show you the “link” click. This was the same idea, but it wasn’t run as a lead ad. We actually built a landing page with a survey form on it and we drove traffic to that, to it. So, what … the language here is pretty much the same. The only thing that’s different is that, when someone clicks “learn more”, they’re taken to a landing page instead of the lead form that pops up in the other one. Here’s, again, why I know this is a winning offer. Because for me to get someone to click that link was costing less than 20 cents. Less than 20 cents! And because of all of the other things that we’ve got in play here. Our new retargeting plan and road map, that I’ll be sharing here, on these kind of lives, in the coming days and weeks. And some of the other pieces of the puzzle. I know that those people that clicked here, I’m gonna be able to pull them back, to call them back, and get the ones that are most motivated, to call me, to email me, to text me, to connect with me and give me the opportunity to list their home. Getting a little ahead of myself. So, when they click on this link, this is what comes up. It’s a survey. And as they answer questions, these pop up. I … from this, I got four leads as well, and … What was the cost on that? Bear with me here. I think it’s bogged down ’cause I’m recording as we go here. Let’s get rid of this here. Come on Facebook. Well, as that’s loading … Let me say this, if this kind of stuff excites you. Leveraging social media, Facebook, Instagram, and the like, then you definitely should check out 5xlistings.com. It’s a free class that we’ve put together for you, sharing the formula that we have crafted and honed over time, that clients of ours are using with tremendous results. In fact, one of the fellows, the stories that I share early on in that class is how … he had so many listings, more than he had ever had, thanks to us, that he actually had to turn down his marketing so he could get caught up. It’s a pretty good problem to have. I don’t know why this is not coming up here, but definitely, I would highly encourage you to check that out. 5xlistings.com. Okay, now here. It came back up. And we’re gonna come in for a landing soon. If you like this, let me know. Hit the like button. Comment below. And if somebody who’s watching wouldn’t mind, if you can get to it before I do, if you could put that URL in the comments. 5xlistings.com, that would be awesome. It would be greatly appreciated. So, this one … this one was $21 and I got four leads from that one as well. Here’s the other indicator that this is a winning concept. The relevance score of 10. A relevance score of 10! The range is 0 to 10. So this is a perfect relevance score. That means that Facebook is going to give this campaign preferential treatment versus other marketers. So, we got a great offer. We just need to tweak the survey so that we can collect, and connect with, more of those interested parties. Again, if you like this kind of stuff, check out 5xlistings.com. And be sure to check in often, ’cause I’m gonna make some tweaks to this. And then I’ll report back in a few days, how those tweaks have affected, hopefully positively, affected those results. Again, if you like this, let me know. If you found it valuable, I certainly would appreciate it if you would share with others in our community. And check out the class, 5xlistings.com. And hopefully we’ll talk again real soon.